In today’s hectic, ever-changing world, maintaining a strong, loving family dynamic can be difficult. Modern parenting requires us to be ambidextrous jugglers, after all. Family, career, housework… we must juggle it all, and for many of us, the days often don’t seem long enough. It’s easy to fall victim to SuperMom/SuperDad Syndrome — you try to pack 30 hours worth of activity into a 24-hour day. But all that juggling can leave you stressed and feeling burned out. That stress inevitably spills over into your interactions with those closest to you, and of course, how a parent manages stress becomes a model for the kids. If we don’t cope well with the stresses of parenthood, our kids may imitate our unhealthy behaviors — another stress spillover effect: our kids are now having to cope with our stress, in addition to their own. And we all know that kids who experience family stressors have a harder time learning at school and an increased likelihood of getting into trouble, which in turn will only lead to more family stress. Certainly, you’ll find no shortage of advice, or opinions about what your self-expectations “should be.” But the vast sea of (often conflicting) parenting and relationship advice out there can become confusing. If you’ve struggled to find your own true north, Sahaja meditation can help you find the answers from within. The happiness of each partner and the durability of all family relationships is dependent on the quality of the relationship. What constitutes “quality?” No doubt you have your own ideas, but most any list would probably include attributes such as mutual goals, trust, affection, respect and emotional support; the ability to manage stress and resolve conflicts; and the feeling of being understood, even when no words are spoken. Sahaja meditation allows you to harness the healing power of your inner energy to boost your mental and physical resilience and improve the personal qualities that foster deeper bonds with loved ones. You’ll be better equipped to cope with whatever challenges come your way. We all make relationship mistakes from time to time, but meditation will help you stay focused on the present, rather than ruminating about past mistakes you may have made, or worrying about what the future holds for your family. Meditation will increase your awareness of how you’re interacting with family members and how your actions impact them. You’ll become more attuned to your loved ones, rather than simply racing through the days on autopilot. Couples become better able to fulfill their partner’s emotional needs. And parents, whether they’re parenting adolescents, ’tweens or teenagers, become better able to fulfill their kids’ emotional needs and build a motivational framework that will last a lifetime. How young is too young? Any child who is able to sit still long enough to meditate can benefit from Sahaja meditation. In fact, many children are ideal candidates for meditation because the inner energy rises easily in children, who are still innocent and uncomplicated. They’re born innocent, of clearer consciousness right from the start, unlike us adults.As time goes by, we may accumulate negative energy, conditioning and ego defensiveness. Meditation, for us, effectively becomes a detox, a quest to return to the innocence of youth — especially in the beginning. What special emotional abilities improve the quality of relationships among couples and between parents and their kids? Following are some specific mental, physical and spiritual benefits of Sahaja meditation that help build a happy, healthy family dynamic. In real life, especially in the most trying moments, being able to understand the needs and feelings of your family members and exercise empathy, patience and self-control can require a combination of sophisticated emotional skills. Emotional intelligence (EI) is a key element in the repertoire of special emotional abilities required to successfully negotiate the relationship ups and downs in both couples relationships and parent-child relationships. Emotional intelligence can manifest in idiosyncratic ways in any one relationship, but could be summarized as the capacity to perceive, identify, express, understand, manage emotions in oneself and others and to use that information constructively to assist thought and achieve life goals. EI is the emotional-cognitive mechanism through which we reason with — and about — our feelings. And feelings are the very heart of the bond between family members. EI shapes our understanding of ourselves and our interactions with others. It defines how and what we learn from our experiences and helps us set clear priorities. It enhances our ability to be good team players, and what is a family if not a team? It helps you channel your feelings and impulses purposefully, keep your goals in mind, and pursue those goals with energy and persistence. Your own internal process of self-realization increases your compassion for, and sensitivity to, others and improves your communication skills and empathy for others, which improves every aspect of your relationships. Sahaja meditation school programs have been found to promote emotional intelligence in children. Empathic children, even those who don’t have high IQs, do better in school and are more popular than their less empathetic peers. The U.S. Head Start program for preschoolers has shown that early academic success was achieved not by intelligence but by factors such as understanding what kind of behavior is expected from them, the ability to rein in the impulse to misbehave, and the abilities to wait your turn and get along with other children (Oden et al, 2000). The quality of our relationships is directly related to our ability to form secure attachments or affectional bonds to others. Attachment is that special emotional bond between two people that provides comfort and safety. It is a lasting psychological connectedness. It becomes our safe haven in times of illness, danger or distress. And our level of emotional intelligence directly impacts our ability to become securely attached to others — it’s a bidirectional relationship. Insecure attachments, on the other hand, make us more emotionally defensive. The defenses associated with insecure attachment block our awareness of feelings in ourselves and others and inhibit our ability to correctly process emotional messages (Bowlby, 1988). While defense strategies may help us avoid pain, they leave our relationship partners feeling dissatisfied or uncomfortable. Avoidance, or the failure to attend to attachment-related experiences, prevents us from ever having a deep, rich emotional life, which prevents us from having a deep, rich family life. Mindfulness is a critical component of every healthy relationship, at the most fundamental levels. An overwhelming body of meditation research has demonstrated that meditation significantly enhances mindfulness, and that mindfulness can directly alleviate suffering in our lives (e.g., the many studies of researchers Jon Kabat-Zinn and R.J. Davidson). Mindfulness can be characterized as the ability to self-regulate one’s attention to focus on the present moment with curiosity, openness and acceptance. The ability to pay attention to the present moment includes self-awareness — the ability to observe and monitor your thoughts, feelings and sensations as they are happening and to be in touch with your actual felt experience. You can think of mindfulness as nonjudgmental awareness, focusing on the present moment without the stress of judging it. Mindfulness is the feeling of being fully present and alive in the moment and accepting each thought, feeling and sensation that arises as it is. Mindfulness allows us to observe our thoughts and feelings merely as events in our minds, without over-identifying with them or reacting to them automatically or habitually. This calm, dispassionate state of self-observation inserts, in essence, a “space” between our perceptions and our responses. That open space allows us to respond to situations reflectively, rather than reflexively. Mindfulness during meditation does not directly address the content of thought; rather, it changes our relationship to our thoughts. Through Sahaja meditation, we are able to uncouple feeling from thought. Mindfulness during meditation does not directly address the content of thought; rather, it changes our relationship to our thoughts. Meditation allows us to note our thoughts and feelings without viewing them as frightening, catastrophic, anger-inducing or depressing. When distracting thoughts and feelings arise during meditation, we acknowledge them with emotional detachment and release them, rather than engaging in elaborate cognitive processing or reacting emotionally. We realize that negative emotional processing can be caused by thoughts and feelings that are merely “mental events ” — perceptions — rather than realities. Mindfulness gives us the ability to tell the difference. Conducting our lives mindfully, with openness, curiosity and acceptance, helps decrease our reliance on nonconstructive coping strategies (such as repression or other defense mechanisms) in order to avoid painful aspects of our relationships. Learning to simply accept painful or unpleasant thoughts and feelings can change the psychological context in which these events are experienced — you’ve just created a more constructive relationship with your thoughts and feelings and diminished their power over you. And you’re poised to gain insights into the true nature of those thoughts and feelings and develop a rational, mature perspective; for example, you might come to view them simply as passing events in the mind rather than valid reflections on reality or absolute truth. Meditation research has shown that mindfulness activates certain neural circuits, harnessing the social circuitry of the brain in ways that enable us to be better attuned to both ourselves and to others. The reflective nature of mindfulness has been found to enhance neural connectivity in the prefrontal cortex, an integrative region that is, effectively, the neural hub of our humanity (Lazar et al, 2005; Davidson et al, 2003). Reflective skills have been found to enable flexibility and self-understanding by harnessing the prefrontal cortex’s capacity for executive attention, social behavior, empathy, and self-regulation. Reflection lies at the heart of social and emotional intelligence. It allows us to be aware of our own internal states, as well as the internal states of others so that we can share life with others in a more flexible and compassionate way. One mind connects with another mind via neural circuitry in the brain that’s hardwired to send and receive signals, bidirectionally. The human mind is both embodied and relational — it can be aware of and attuned to both the flow of energy and information within itself, as well as to the minds of others. Relationships are the vehicles through which we share energy and information flow with others. Mindful awareness is a form of intrapersonal attunement, as well as interpersonal attunement: it promotes healthy relationships both with the self and with others. Attunement lies at the heart of all caring relationships (including one’s relationship with oneself), but is especially important in family relationships. Someone who is attuned to another is able to focus his or her attention on the internal world of the other person; for example, a parent is attuned to his or her child or spouse. This focus on the mind of another person engages neural circuitry that enables two people to “feel felt” by each other, to feel connected (Siegel, 2007). This sense of feeling felt makes us feel understood, at peace, vibrant and alive, and connected to ourselves, our loved ones, and to the universe. When we can see ourselves reflected in the eyes of someone else, and when that reflection is attuned, we have an authentic sense of ourselves. Attunement and mindful reflection nurtures secure attachment, which in turn promotes these capacities for reflection and attunement in others with whom we share close relationships (Fonagy, 1997). Sahaja meditation fosters attunement and integration within relationships. Not only does attunement strengthen emotional bonds, it allows us to nurture in each other an access to a core self that lies deeper than personal identity, that core of being that we all share beneath the adaptations of everyday life and aside from individual personality traits. The ability to maintain attuned relationships has been found to promote resilience and longevity (Siegel, 2007). Attunement plays a role in neuroplasticity and helps promote emotional self-regulation through neural integration, the process of communication (neural connections and complex patterns of firing) between disparate parts of the brain responsible for everything from cognitive to sensory functions. For example, interpersonal attunement in adult-child relationships enhances the development of prefrontal functions in children. Interpersonal (internal) attunement with the self harnesses neural integration in the prefrontal regions of the brain to promote a reflective, adaptive mind, a resilient brain, and empathetic, compassionate relationships (Siegel, 2001). One review of American and European studies found that emotional expressiveness and communication were the two most important contributing factors to marital quality and conflict resolution, followed by empathy, self-awareness and impulse control (Batool, Khalid, 2009b). Conflicts inevitably surface in every relationship sooner or later. But Sahaja meditation can help enable relationship partners to view conflict as a natural outgrowth of relationships and separate the partner from the problem. The secret of a healthy relationship is not the absence of conflict; rather, it’s the ability to effectively resolve those conflicts. 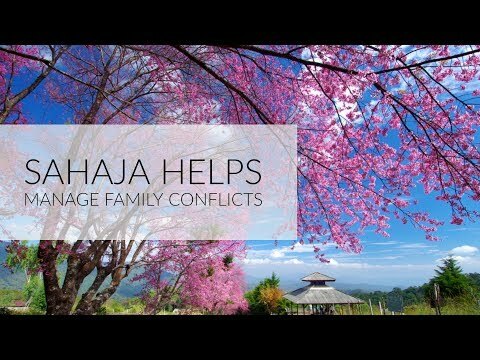 Sahaja meditation helps diminish anxiety, anger, and fear so that both parents and children can respond to conflicts in considered, emotionally intelligent ways. Happiness in relationships can depend upon each partners’ ability to constructively cope with conflict and to understand and manage negative emotions like anger, resentment and hate. Thus, higher emotional intelligence can lead to better management of disagreements, which, in turn, improves relationship satisfaction. Higher EI, for example, can enable a couple (or parent) to more effectively manage the delicate emotional negotiations involved in seeking and granting forgiveness. Meditation enhances qualities (e.g., emotional intelligence, self-awareness, mindfulness, emotional regulation and decreased emotional reactivity) that help us maintain proper emotional perspective and emotional equanimity during a conflict. In our closest relationships, emotions tend to be contagious, spreading from one partner to the other; for example, you may “catch” your partner’s feelings of anger, anxiety or depression. When both partners are experiencing negative emotions at the same time, each feeds the other and the relationship dynamic becomes more volatile. 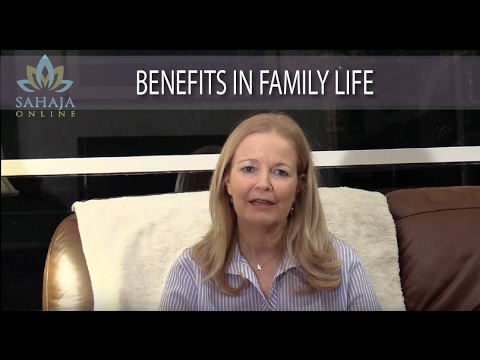 Meditation as a part of a family lifestyle can be an especially helpful tool for healing here. It bears mentioning that emotional contagion can also be a good thing: It is also possible to be “infected” with your partner’s joy, optimism, confidence and enthusiasm! Emotional self-regulation. Sahaja meditation helps you master your emotions, which allows you to focus and solve family problems, rather than waste time feeling inadequate or guilty about your mistakes and reflecting on “what you should have done.” You’ll learn to live in the present, rather than dwelling on the past (common in depression), or worrying about the future (common in anxiety). Sahaja meditation functions as an emotional regulator, producing lasting changes through, primarily, two mechanisms: attentional control (by controlling what we pay attention to) and cognitive control (by exercising conscious control over our thoughts and feelings). Meditation helps us detach emotion from thought and pay nonjudgmental, nonreactive attention to all aspects of our experience, which reduces emotional reactivity and helps develop a mature emotional perspective of how to manage daily family life. Emotional self-regulation functions within our attachment style. Secure people have very different strategies for processing, expressing and regulating emotion than people with insecure attachment styles. Secure partners use emotional regulation strategies that minimize stress and emphasize positive emotions. Insecure partners, on the other hand, not only tend to experience more negative emotions but also experience events more stressfully (e.g., anxiety, excessive neediness or nagging), or tend to avoid intimacy through defense mechanisms such as suppressing those emotional experiences (Kafetsios, 2004; Searle and Meara,1999). Increased self-control, impulse control and attention. Many studies have established that self-control is a major causal factor in later life successes (or failures) (Mischel et al, 2004). We all have beliefs, attitudes, memories, impulses and biases that can control our thinking and prevent us from being mindful of how our actions affect others. Sahaja meditation helps us take control of impulses that are harmful to our relationships. We develop the maturity to focus on a desired goal, control impulses, and delay gratification when it’s necessary to serve a greater, long-term goal. Sahaja meditation can be a particularly effective management tool for families with children who have any form of AD/HD. One Australian family study of children with AD/HD and their parents found that Sahaja meditation reduced childrens’ AD/HD symptoms, increased self-esteem and relationship quality. Parents and children participated in a 6-week program of twice-weekly Sahaja clinic sessions and regular meditation at home. Children reported sleeping better, lower anxiety, better concentration and experiencing fewer conflicts at home and school. Parents reported feeling happier, less stressed and better able to manage their child’s behavior (Harrison, Rubia, Manocha, 2002) Sahaja has been found to reduce symptoms of hyperactivity by reducing sympathetic nervous system activity (Rai et al., 1988; Harrison, Rubia, Manocha, 2002). Improved self-awareness. Sahaja meditation increases self-awareness. You’ll become better at recognizing when behavioral patterns are not serving the best interest of the relationship and adjusting those behaviors. Sahaja meditation’s built-in therapeutic process functions, in part, as a mirror for self-reflection — a powerful mechanism for self-improvement and personal growth. Self-reflection is a powerful mechanism for self-healing and self-improvement. Once you’ve experienced the inner energy awakening and begin meditating, your attention turns inward — deep inside yourself, to your own subtle energy system. Sahaja boosts your powers of introspection and strengthens your ability to focus on self-improvement and developing better personal qualities. You become more focused on how to improve yourself and spend less time worrying about how to improve others. Once you become attuned to your own energy centers through Sahaja meditation, you’ll have live and constant feedback of what’s going on with your mind and body. This powerful self-diagnostic tool allows you to quickly pinpoint the root causes of your problems, learn from your mistakes, and adapt your behaviors to achieve your goals. You’ll develop a deeper understanding of the universe and your place in it. Enhanced self-awareness and introspectiveness will allow you to see your unique gifts and talents with clarity (as well as your child’s), identify strategies to overcome obstacles and heal old wounds and, ultimately, transcend the limitations that are preventing you from achieving your highest potential. Improves self-esteem. It is widely established that kids who are depressed or angry literally cannot learn in school. Negative social experiences in a child’s early years can set the stage for negative outcomes as they grow older. Children who are emotionally mistreated or feel rejected, whether by parents or by their peers, usually suffer low self-esteem and a sense of low self-worth. They grow up with little ability to understand and manage their emotions, which naturally impairs their ability to understand and manage the emotions of others. Childhood peer relations have in fact been identified as one of the most powerful predictors of mental health problems (Mueller, Silverman, 1989). Sahaja meditation makes both children and adults more self-reliant and inner-directed. We don’t need to depend on others to feed our self-respect or provide proof of our worth. Meditation allows us to process how we feel about ourselves objectively, rather than through preconditioned biases or beliefs. Our thoughts are not filtered through negative, immature, or egoistic filters. Our subconscious self-appraisals become incorporated into our conscious experience of ourselves without judgment, which ultimately promotes secure high self-esteem. Sahaja meditation nourishes the heart energy center (Anahata), which increases self-esteem by strengthening our sense of security about ourselves. The energy center at the center of the forehead (Agnya) plays a big role in monitoring and regulating the ego. The regular practice of meditation can improve character and personality traits over time, ultimately increasing your level of self-respect. When we can maintain high levels of self-respect, we develop a deep reservoir of secure self-esteem. Sahaja meditation helps instills contentment and happiness from within and promotes optimism and positive thinking, which helps build an inner confidence that one will be successful at work or school and banish distracting, self-damaging fears and anxiety, such as a fear of unknown or unpredictable results. You develop confidence in your skills and abilities and become better at managing change. And freeing your mind from stressful thoughts and feelings through meditation frees more of your energy to relax and enjoy family life. Reduces defenses. Sahaja meditation harnesses the healing power of our inner energy to help mediate our internal emotional conflicts. Meditation helps heighten your awareness of your own defense, break down your defenses, and help you work through the unpleasant thoughts and feelings you may have been defending against. Adjusts negative thinking. Sahaja meditation’s state of thoughtless awareness frees the mind of self-defeating thought patterns and faulty, rigid belief structures that keep us stuck in a cycle of negativity. You become better equipped to analyze your own feelings and pinpoint what’s triggering negative emotions and reactions. Better stress and anxiety management, coping skills and total mind-body resilience. First, Sahaja meditation decreases physiological arousal, which directly impacts how stressed we “feel.” Meditation also promotes accurate appraisals of stressors, which improves coping and leads to smarter decision-making. The sense of inner calm you experience during Sahaja’s state of thoughtless awareness instantly boosts your energy level and emotional resilience, enabling you to better cope with stressful events in the future. Regular meditation activates a built-in stress management mechanism that helps your cope with stressors on an ongoing basis, enhancing long-term resilience. Freeing your mind from stressful thoughts through meditation frees more of your energy to enjoy all the good things that life has to offer every day. Enhanced self-actualization for both children and adults. Self-actualization can be thought of as the higher human quest to be creative, to grow, to acquire knowledge, to develop our abilities and fulfill our potential. Self-actualization is an ongoing state of being and becoming. It is the process of actualizing one’s potentialities at any time, in any amount. We all have the potential to self-actualize, to become all that we can be through a lifelong process of self- And isn’t that a higher state of human development that we all hope our children will reach? In self-actualizing moments, we are experiencing fully, vividly, selflessly, with full concentration and total absorption. We are wholly and fully human. Through Sahaja meditation, we learn to make growth choices instead of fear choices. We develop an authentic self, and strive, from our very core, towards growth like a plant reaches toward light. Meditation frees the mind to focus on higher being needs (e.g., truth, goodness, justice, richness), rather than only the lower deficit needs (biological, safety, belongingness and love, esteem). The practice of Sahaja enhances clarity and focus and help pave the path to becoming the person you aspire to be. In other words, Sahaja both makes us aware of our higher level needs and helps empower us to achieve them. Meditation allows you to take responsibility for your own self-improvement, at your own pace, and provides an ongoing support system for continued growth and development. You will find that you develop a deep, continually renewed appreciation for small daily gifts that others take for granted and an appreciation for art, beauty, nature and the subtle aspects of things. You’ll become more self-determined, self-sufficient, inner-directed, self-controlled, and self-regulating. And you’ll be more open to change and new experiences. Meditation not only enhances those qualities, but helps you use these qualities in practical ways to achieve greater heights of fulfillment, self-transcendence or self-realization and, ultimately enlightenment. Batool, S. S., & Khalid, R. (2009b). 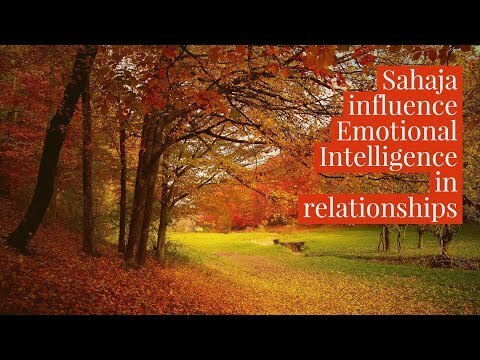 Role of emotional intelligence in marital relationship. Pakistan Journal of Psychological Research, 24(1-2), 43-62. Bowlby, John (1988) A Secure Base: Clinical Applications of Attachment Theory. Routledge. London. Fonagy, P., & Target, M. (1997). Attachment and reflective function: Their role in self-organization. Development and psychopathology, 9(4), 679-700. Harrison, L., Rubia, K., Manocha, R.. Sahaja Yoga Meditation as a Family Treatment Program for Attention Deficit Hyperactivity Disorder Children. Clinical Child Psychology and Psychiatry, 2004, 9 (4), 479-497. Konstantinos Kafetsios. Attachment and emotional intelligence abilities across the life course. Personality and Individual Differences, Volume 37, Issue 1, July 2004, Pages 129–145. dynamics of delay of gratification. Handbook of Self-Regulation: Research, Theory, and Applications, eds Baumeister RF, Vohs KD (Guilford, New York), pp 99e129. Mueller & Silverman. (1989), Peer relations in maltreated children. In D. Ciccheti & V. Carlson (Eds.) Child maltreatment: Theory and research on the causes and consequences of child abuse and neglect (p. 529-578). New York: Cambridge University Press. Oden S, Schweinhart L, Weikart D: Into Adulthood: A Study of the Effects of Head Start. Ypsilanti, Mich, High Scope Press, 2000. Rai, U.C., Seti, S., Singh, S.H., 1988. Some effects of Sahaja Yoga and its role in the prevention of stress disorders. Journal of International Medical Sciences 19–23. Searle, B., & Meara, N.M. (1999, March). Affective dimensions of attachment styles; Exploring self-reported attachment style, gender, and emotional experience among college students. Journal of Counseling Psychology, 46(2), 147-158. Siegel, M.D., Daniel J.. (2001). Toward an interpersonal neurobiology of the developing mind: Attachment, “mindsight”, and neural integration. Infant Mental Health Journal, 22, 67-94.